Drinks can recycling programme Every Can Counts has launched a new online game to get users of social media across Europe to think more about recycling. Hosted on Facebook, the #OlympiCAN game aims to engage with online audiences across nine European countries, including Ireland. The new game has a sporting theme and tasks players to sprint along a running track jumping hurdles and collecting as many empty drinks cans as possible within 60 seconds, collecting points for every can recycled. Players who score 1000 points or more are then entered into a prize draw to win a national prize. In Ireland the winner will receive €150 Amazon vouchers. Across Europe those scoring over 2000 qualify for a further prize draw for a chance to win a ‘Ricicletta’ bicycle made of 800 recycled aluminium beverage cans. 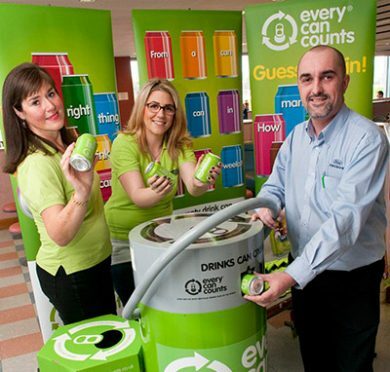 The OlympiCAN game is the result of co-operation across the European Every Can Counts recycling network. It has been developed and project managed by digital marketing agency UCME, based in Greece, with help from Every Can Counts team and Alupro in the UK. The ‘Ricicletta’ bike is made in Italy under licence from CiAL, the Italian Consortium for the Recovery and Recycling of Aluminium – sister organisation to Every Can Counts project manager Alupro. Every Can Counts #OlympiCAN is available on Facebook and open for entries until 26th August.